Team beats Angola 3:1 in final to claim title. 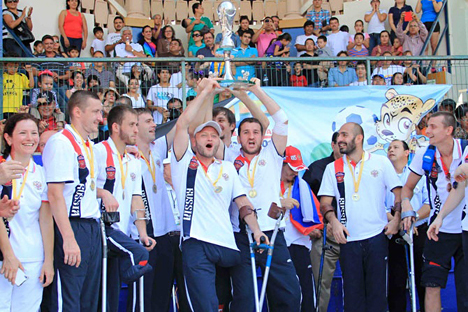 The Russian team emerged victorious in the Amputee Football World Cup in Mexico on Dec. 8, the Russian Football Union said in a press release. The Russians beat Angola 3:1 in the final match. Turkey took home the bronze medal. “From the bottom of our hearts, the Russian Football Union congratulates our team on its victory and thanks the players for showing skill, supreme courage, and brilliant moments as a gift to fans on the football pitch,” the Russian Football Union said. The Amputee Football World Cup is held once every two years. The last one was hosted in the Russian city of Kaliningrad in 2012. The Uzbekistan team took the gold, followed by Russia and then Turkey. According to Deputy Prime Minister Olga Golodets, there are 12.85 million amputees living in Russia. Originally published in Russian on the Argumenty i facty website.